Romesco is a traditional Catalan sauce, often served with white fish. It’s also great partnered with chicken or lamb chops, or spooned over green vegetables. 1. Preheat the oven to 200 ̊C gas mark 6. For the romesco sauce, put the peppers, garlic and tomatoes on a foil-lined roasting tray, drizzle with 1 tbsp olive oil, season, and roast for 30 minutes. Toss the bread with 1⁄2 tbsp oil and put in another tray with the nuts. Place in the oven for the final 10 minutes of roasting. Remove everything from the oven; allow to cool. 2. Turn the heat up to 220 ̊C, gas mark 8. Toss the fennel and the lemon slices with 1⁄2 tbsp oil and scatter in a roasting tray. Roast for 20 minutes, tossing halfway through. 3. To finish the romesco sauce, remove and discard the skin from the peppers and tomatoes. Blitz the nuts in a food processor until roughly chopped. Add the tomato and pepper flesh, toasted bread, extra virgin olive oil and vinegar. Squeeze in the garlic cloves, discarding the skin. Blitz to a smooth sauce; season and set aside. 4. Heat the remaining 1 tbsp oil in a large frying pan over a medium-high heat. Season the cod fillets and fry skin-side down for 2-3 minutes, then turn and fry for another 1-2 minutes, until cooked through. 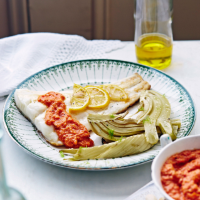 Serve the cod with the fennel, lemon slices and the romesco sauce spooned over the top.